Tales Of A Nomad: Shaivism, Vaishnavism and Jainism...!! ﻿The last time I had been to Chikmagalur, i missed out on the beautiful Hoysala architectures at Halebeedu and Belur. So with these two lovely heritage sites in my mind I squeezed in Shravanabelakola to make it a lovely triangular trip. With my steed always willing to travel anywhere, I didnt think much and set out on a beautiful heritage ride to the land of Hoysalas. The roads were single lanes for most of the part and with the work for double lanes under progress, my ride was quite a mixed one. Cafe Coffee Days are omnipresent and NH-48 wasnt devoid of them making them my pit stops enroute. 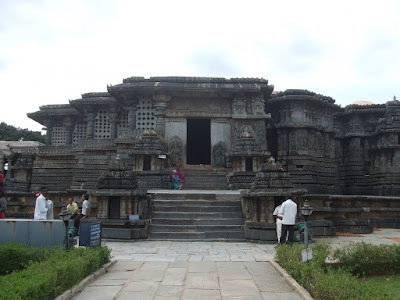 Halebeedu, which was earlier known as Dwarasamudra in yesteryears is known to be the heart of Hoysala architecture. Built during the 12th and 13th century, this beautiful temple is covered with stunning stone carvings. 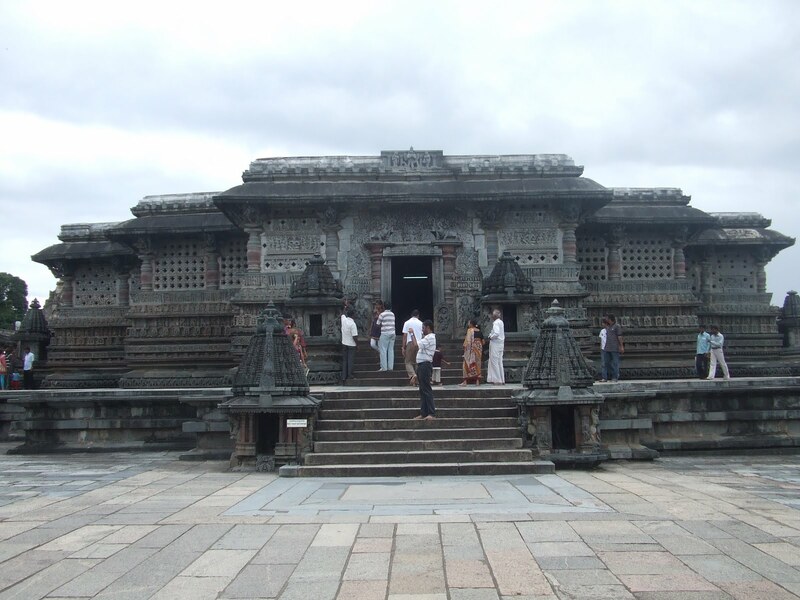 There are 2 temples namely Hoysaleshwara temple and shantaleshwara temple which are joined together by a single platform. The temple has been dedicated to Lord Shiva. 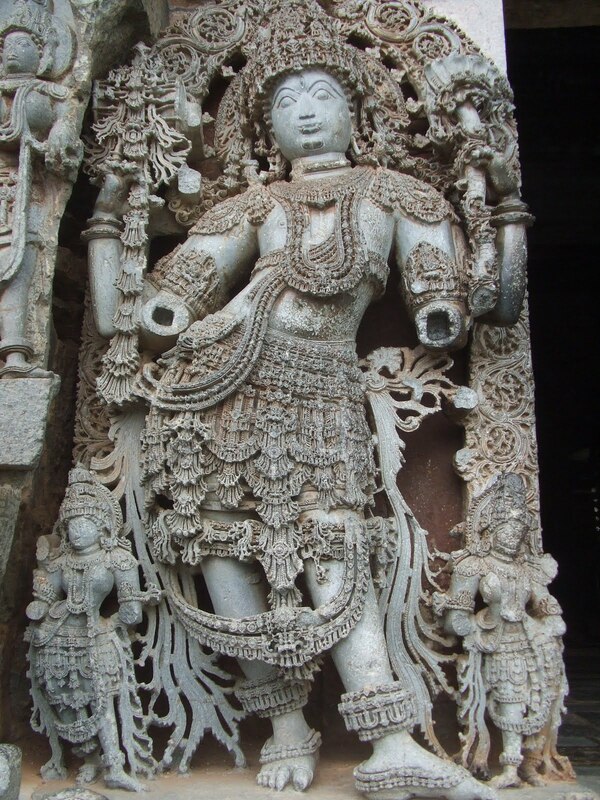 With extraordinary carvings, this architectural creation can well be compared to the works in Konark and Khajuraho. The carvings have wonderful tales behind them and each carving has a story different from the next. Half a kilometer from here is the Kedareshwara temple and the Jain Basadi halli. There is hardly anything else that one can do at Halebeedu other than admiring the amazing works and gasping at their beauty. History lovers can venture deeper into the stories behind each carving with the help of tour guides who are easily available at the temple. 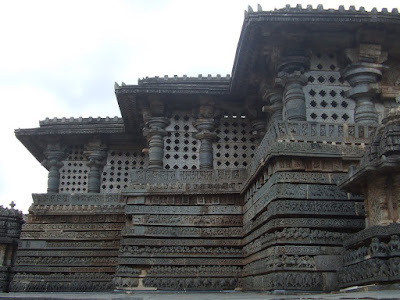 32 kms from Halebeedu lies Belur, where the very famous Chennakeshava temple is located. According to history, this temple which is dedicated to Lord Krishna was built to celebrate the Hoysalas victory over the Cholas. The exterior of this temple is also covered by beautiful stone carvings. There are also a lot of small mandaps around the temple. The inner sanctum has numerous pillars which are well carved out. There are a lot of shops around the temple selling paraphernallia. I bought a small ganesha carved in stone for my table top. Both Halebeedu and Belur are like twin towns and a visit to one is incomplete without going to the other. On my way back I took a deviation at Hirisave and headed towards Shravanabelakola. This is one of the most important pilgrimage centres for ﻿Jains. The 60feet tall monolithic statue of Gomateshwara is world famous. Mahamasthabhisheka is held here once in 12 years during which thousands of litres of milk is poured over the statue. There are around 600 steps which are carved out on Indragiri hill that you need to climb to reach the statue. However, once you reach the top and stare at the massive Gomatshwara, you would very well say that the climb was worth it. Hassan would be the ideal place to have an overnight halt for a weekend trip to the 3 places. This also helps one to go in detail with respect to the stories regarding the carvings and also for the photoshoots. 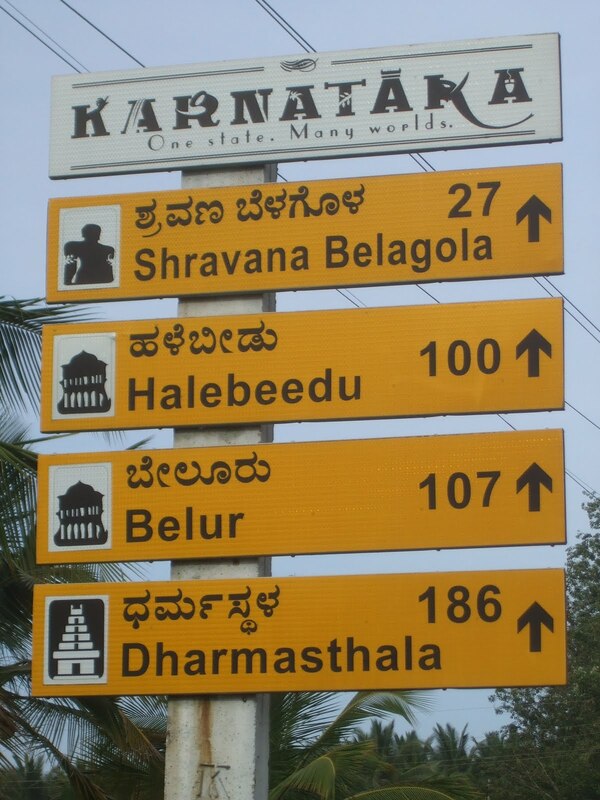 I missed out on Belawadi, which is 13kms from Halebeedu due to shortage of time. This triangular heritage trip was covered in a day but I found it to be too tiring and ran out of time at all the 3 places. Chikmagalur is just 22 kms from Belur and I was quite tempted to turn my steed after seeing the sign board. All the three places are very famous for their extraordinary works and a visit to all of them is a must for any traveler. Let the landscapings and the waterbodies take a back seat and lets indulge ourselves into a bit of history and architecture. Signing Note: These centuries old man made creations are simply breathtaking. Thanks Senthil for dropping in and for that info on Kolli hills. I suppose i need to make a 2 day trip. Cant wait to get on to those 70 hairpin bends..
thanks Ram. keep dropping in. gr8 keep travelling and blogging. @ dguide...thanks and keep dropping in. Yeah, post monsoons would be ideal.